We know you want that second helping of pumpkin pie. Fight that second (or third!) Thanksgiving helping guilt by signing up for a Turkey Day Turkey Trot! There are tons to choose from in the San Diego area, ranging from beach runs to downtown sprints. Now you can feel good about grabbing that second helping, and most proceeds go to a good cause too! San Diego’s original and longest-standing Thanksgiving Day run, aimed at helping the homeless community. On November 22nd, 2018 join 7,500+ participants and spectators in Balboa Park for this 17th annual event! 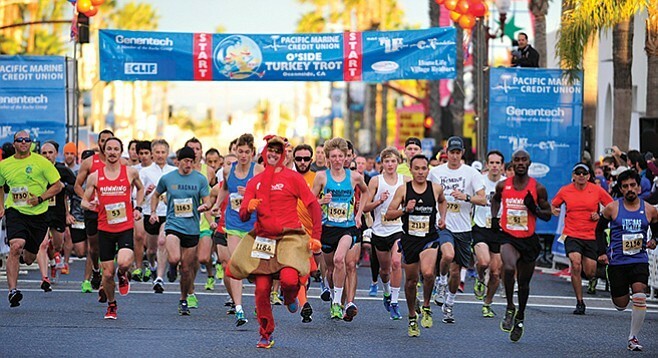 Looking for a Thanksgiving Day run in San Diego where everyone can be happy? Look no further! Show up to run this Turkey Trot and bring a basket of food for the food drive! Runners and walkers of all paces are invited to explore the Santee Lakes during this annual 5k. Trot your stuff through the Grand Tradition Estate and Gardens at the annual Thanksgiving Day race. The Running of the Turkeys 10k Trail Run will take you through rolling hills of Penasquitos Canyon on wide dirt trails with a fun little water crossing.